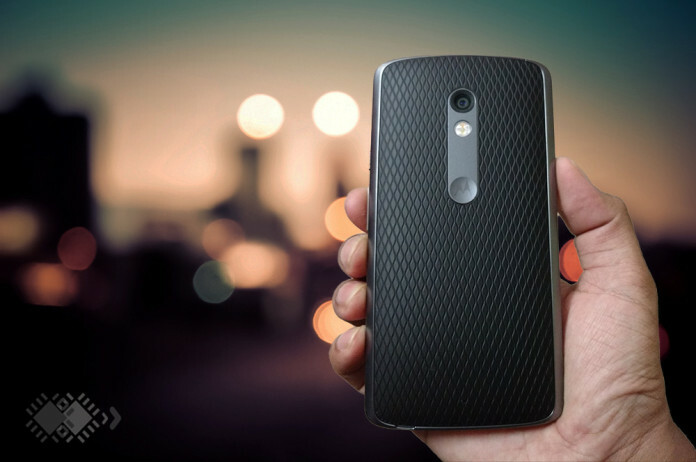 Moto X Play – which was one of the best mid-range budget smartphones of 2015, would continue getting Android updates roughly for 2 years (starting from Sep, 2015). The smartphone offers a complete stock Android experience along with a great battery life. In the month of January, users received the Android Marshmallow update along with the latest security patch. Well, few of the smartphone manufacturers have managed to push the Android 6.0.1 update. And, Moto X Play users are lucky enough to have received it. However, the device didn’t support VoLTE for some reason and it was not a good news to most of the users in India. The reason – Reliance JIO (an Indian telecom company) is at the edge of launching 4G LTE with VoLTE. For now, the Reliance JIO SIM cards are available only to Reliance employees and to the ones who would purchase the LYF mobile in order to experience the network. Not to brag, but it’s by far the most powerful network ever to offer 4G LTE with VoLTE in India. As you can observe in the image above, the new version tags along the figure as 24.61.70.en.03. Now, that it supports VoLTE for Reliance JIO network, users can enjoy high-speed 4G! It doesn’t end here, though, the update also brings in the latest Android security updates released until May 1, 2016. Various bugs have been addressed and the update log mentions to improve the stability of the system as well. Did you receive the update? Is there a noticeable bug? Let us know in the comments section below. Installed the update. No difference. ‘Enhanced 4G LTE’ mode is also not displayed on ‘mobile network settings’ screen. Inserted the Jio Sim after update, but not working. So, I put back in LYF. Whether the jio sim came with LYF phone and 3 months unlimited offer, works in xplay after this update? People say that it works only in LYF phone as the IMEI of the phone and sim is locked together, and the sim can be inserted in other phones only after Jio’s commercial launch. What’s your idea? Yes, it is true that the SIM currently works only with LYF mobile (locked to it) and can’t be used elsewhere. 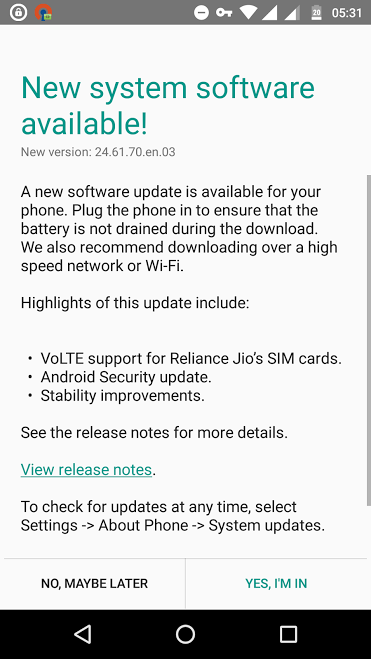 However, the update enhances device security and would support VoLTE when JIO SIM cards would be available to everyone. Have you inserted the JIO SIM in slot 1 ? If not please try. Because one of my collegue had inserted JIO SIM in slot 2 and LTE was working fine. But after the VoLTE update she was having similar issue. When the slot of changed from 2 to 1 she got Enhanced LTE options and VoLTE in Notifications. VoLTE is working fine now on Moto X Play. I would suggest you to wait for the JIO SIM Cards to be available for all. Currently, it seems to be locked at LYF Mobiles only. I’ve tried it as well but didn’t have luck making it work. So, I’ll suggest you to wait. Some time speaker nor works ..works after reboot..
After the Update my speaker and mic is not working during call, it works only when i put it on Speaker than only i can talk, please help. How to resolve mic problem? When ever I’m cheking system update my moto x play is showing “Your system software is up to date”… Can anyone help plese!! After updating my moto x still not shows VoLTE ..
What shoud I do now..??? But I already use 4G LTE simcard of other company…..
Only Reliance JIO supports VoLTE. No other network operator supports it at the moment. So, try inserting a JIO SIM and you’ll be able to see the “VOLTE” icon in the status bar. If you’re facing problem, ask one of your friends to generate another code for you. After getting the SIM, if you have further problem activating it, insert the SIM on the same phone of your friend and activate it. After it’s activated you can use it on your device with MyJio app installed. I’m using JIO sim on my Moto X Play. Sir, even i hav moto x play … since two days m unable to Generate Bar Code… It does show “Get Jio sim” , But once clicking on tat.. i always get “Our system not responding… try again later..” Tried my time.. sent mail to customer care.. tried at night 2-3am.. stil same result.. Plz help ..Thank u.. If you’re facing the problem, ask one of your friends to generate another code for you with the help of another device. However, the SIM would be available for all now. You could wait for a few days and visit the reliance store to get it without generating a code (there’s just too much of rush now), just like you get an Airtel SIM or so, it’s the same with JIO now. I updated my Moto x play with the latest version. I am unable to select 4g lte option for thr Jio sim in settings. Tried multiple times to change data from my Vodafone sim to Jio sim buts it’s not working.Any solution? It works just fine for me. I think I may have a solution for that. You could simply try switching the data service to the SIM slot in which JIO 4G is active. Hopefully, it would do the trick! Is there any device(moto x play) yet, which do not have Volte support? now(28th june 2017), i want to buy this moto x play ,can i upgrade to volte and can i, receive the volte update this month(28th june 2017)? Yes, you can. I had the Moto X Play and I did receive the VoLTE update and it worked fine with JIO SIM. You’ll get the update too. I hve moto x play which supported volte before.But now it doesn’t support volte.this happened whn i came back from an international trip.my system is also updated bt still i cnt get the volte.please help me with dis. When do I get volte update? I never got any volte support for my Moto x play. I cannot make calls. I don’t know whom to contact for volte update. I updated my moto x play for Jio Volte support (as mentioned in screenshot). After updating to Volte my jio sim is not working properly. I did not receive any calls, sms (including incoming & outgoing). Sometimes around midnight 2am i found VoLte in network side after morning 9am its not found. When it shows i will make calls.